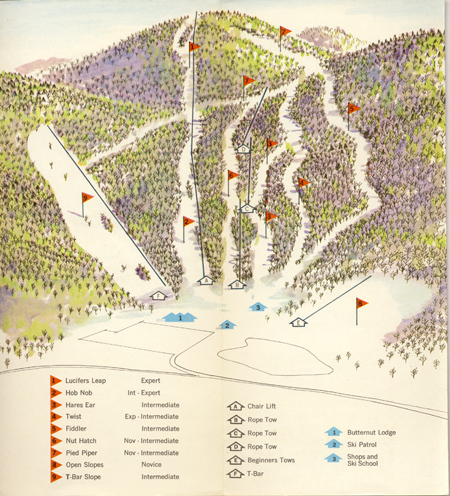 The East Mountain State Forest Ski Grounds, later known as the G-Bar-S Ranch (named for nearby G(reat)-Bar(rington)-S(ports)) was a fairly major rope tow ski area, operating for two decades. It was one of the first snow train destinations and later became known as a family ski area in the 1950's. A series of ownership changes and a major fire resulted in the area closing in 1957. Several years later, the area was sold and was developed into what is now Ski Butternut, with a good chunk of the old ski trails still used today - though heavily altered. This is certainly a unique lost area, and one could make the argument that it is truly not lost, as a few of the original tows were used when Butternut opened. However, with the 5-6 years passing between G-Bar-S last operating as a ski area, and Butternut being completely new venture, we will count this as lost. Henry Cairns was the developer of this ski area, having owned a farm at the base. He had purchased the area in 1929 from James Strike. 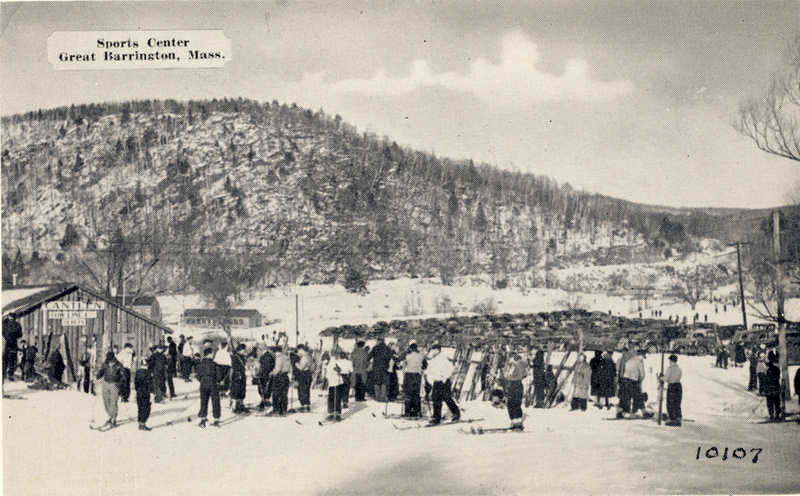 Ski trails were carved out of East Mountain in 1936, and on February 7, 1937, the first ski train passengers made their way to the area. They unloaded at a stop near Beartown, and some actually skied their way the 11 miles to East Mountain. This trail was a cross country run called the Wildcat, and had a 1200' overall descent, 25 max grade, and was 10-50' wide. Others were taken in various vehicles. 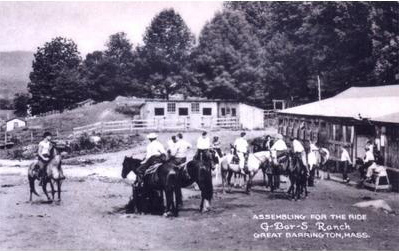 The area grew in popularity with the snow trains, and changed names to the Great Barrington Sports Center, then shortened to G-Bar-S Ranch at some point during this time, with facilities added/improved for summertime ranch operations as well. In 1939, according to Skiing in the East, the area had 2 tows, a ski shop, canteen, an inn with accommodations for 45, and a parking area. A new Adirondack shelter had been built at the top. The slopes in 1939 included the Bottleneck Slope, a wide, safe slope for all classes of skiers at 1500' long, 40-200' wide, 15 degree slope, and 300' drop. The Taconic trail was 0.75 miles long, 630' descent, 18 degree max grade, 20-60' wide, for novices and intermediates. The Forgotten Bridge Trail was parallel and similar to the Taconic, at 4000' long, 630' descent, 22 degree maximum grade, 30-80' wide and was for intermediates. The Warner Slope, was 2500' long, 50-250' wide, 600' drop, 15 degree max grde, and was for novices. Beginners could also enjoy a beginners slope above the Canteen, and a Ranch Slope. All of these trails are still used today (more or less), with more information on them below. 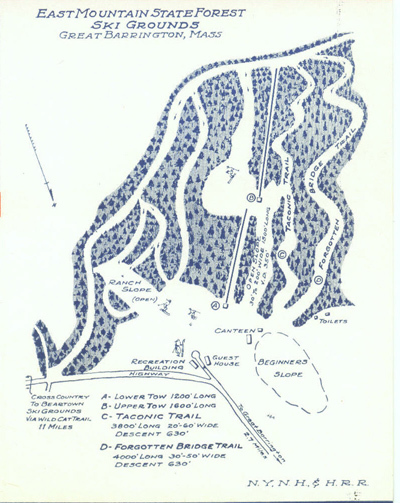 To the right is a late 1930's trail map, showing the trails, courtesy of Woodward Bousquet. Please click on the map for a larger version and brochure. 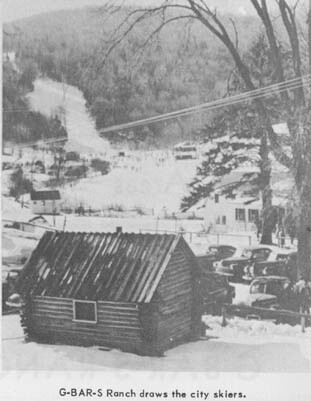 To the left is an undated, but likely late 1930's view of the ski area. Note the canteen to the left. Click on the image for a larger version. The area was a hit, and more trails and tows were added through 1942, with 4 in operation that year. In 1942, with World War II brewing, some nearby ski areas had issues with obtaining gasoline for their tows. G-Bar-S was lucky - their tows were electric, and continued to operate during the War. Cairns was quoted in a Oct 23, 1942 Berkshire Evening Eagle article as having "three two-horse wagons accomodating 30 persons apiece, with which to draw skiers from the village railroad depot. If needed, he will arrange for other vehicles." With the conclusion of World War II, the area continued to operate and grow. In addition to its winter business, the area featured ranch activities like horseback riding. A large dining room at the ranch served skiers in winter and guests in the summer. This 1945 trail map, from the American Ski Annual and courtesy of Laurie Puliafico, shows a detailed map of the ski area. Note that a #4 tow was built to serve the lower Ranch Slop and the lower portions of the Wildcat Trail. A #3 tow served the beginner slope. #1 tow connected to the #2, and served the Warner Slope, Bottleneck Slope, Forgotten Bridge, and Taconic. Note that Josafina du Bat, Czechoslavakian Downhill Champion provided instruction. In the summer of 1946, bulldozers were used to widen and improve trails. For the 1946-1947 ski season, trains continued to bring skiers to the train station, with shuttle busses taking skiers to the area. A change in ownership was in store for the 1950-1951 ski season. The area was sold in June of 1950 for $100,000 (about $950,000 in 2012 dollars) to Jug Eng Barn. Principal shareholders of Jug End that purchased the area included Spencer Logan, Frank Lord, Robert Thomas, and Robert Wheeler. Cairns sold the area to spend more time on his other business, Berkshire Oil out of Canaan, CT. 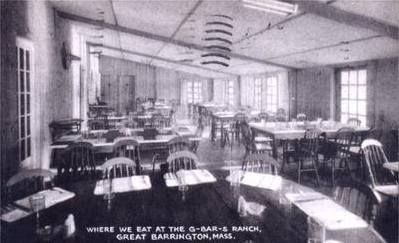 The operations of the two areas were merged, and guests staying at Jug End could also enjoy the skiing at G-Bar-S.
A January 11, 1952 Berkshire Evening Eagle article quoted manager Harvey Cadwell: "Consistently good snow has made our business constant," reports Harvey Cadwell, manager of the G-Bar-S Ranch in Great Barrington. This five-tow, area has run 12 days and is still going strong. Reservations at the ranch have been plentiful and advance bookings indicate near-record crowds will be on hand this week end. The area was host to more than 300 skiers Sunday and about 100 Saturday. "This is already betterthan last year," says Mr. Cadwell." 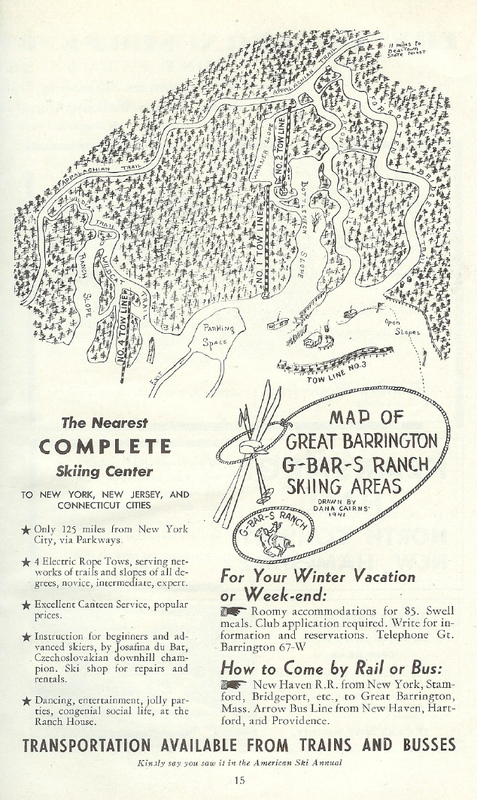 (Right - 1951-1952 Eastern Ski Map ad for G-Bar-S. Note that another ski tow had been added, as well as an improved day canteen). This 1953 trail map from Ski Time. shows a somewhat similar trail layout to the late 1930's. Skiers could ride a series of 3 rope tows to access about 630' of vertical, with interesting trails and slopes. The Appalachian Trail could also be skied down to the Wildcat Trail and Ranch Slope. A beginner area was located above the Canteen. 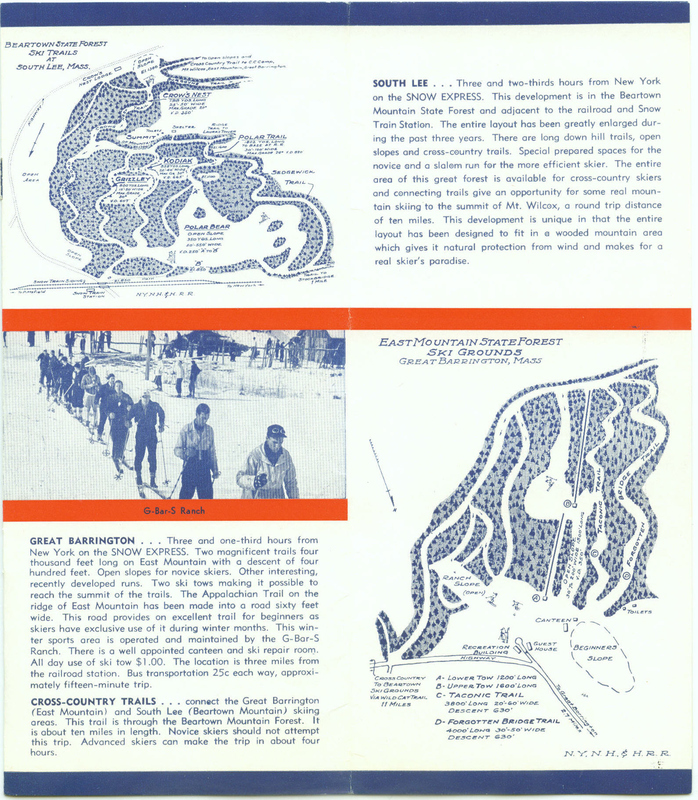 The 1953 guide also described as the canteen being able to serve 600 skiers per hour, with fieldstone and Navajo fireplaces. After dark, the "Rumpus Room" was the center of entertainment, with an orchestra on Saturday nights and dancing. Sounded like fun! This 1953 view shows the ranch. The slope in the background appears to be the lower portions of the widened Wildcat. Jug End continued to operate the area until Francis Mahar in 1954 purchased the area and founded his own corporation, G-Bar-S Corp. Tragedy hit the area hard in the mid 1950's. In 1955, a fire destroyed the 223 year old main house, and on May 13, 1956, fire destroyed the recreation hall. Damage was estimated at $14,000, as the hall been used as the main house since that had burned down the year before. The area did not operate during the 1955-1956 season due to these tragedies. In June of 1956, Mahar sold the area to Stanley V. Wincek who also owned the Mountain View Club. Wincek only owned the area through September, 1956 before selling the area once again due to an illness in the family. The area was sold for $26,000 to Robert K. Wheeler. The 1956-1957 ski season was a good one - with the area determined to succeed. Hugh Dickenson of Claverack, NY, a Tenth Mountain Division Veteran was hired as the ski instructor. H. Albert Stevens noted in February, 1957 that the area was "mobbed as it was in the ski train days". Don Winn and Robert Minkler, served hot food out of the canteen. Peter Groff ran the rental shop of 250 pairs of skis. This appears to be the last season for G-Bar-S as a ski area. It is presumed that the previous fires and numerous sales had taken their toll on the property. The area remained unused until 1962, when it was purchased by Channing Murdock, and then developed into Butternut Basin. The old rope tows were used through at least the late 1960's.The trail map on the left, from the mid 1960's, shows the 3 rope tows in succession, still in operation, along with the beginner tow. Click on the map for larger version. New England Ski History has more information on the area as it developed into Butternut. More information is also available on Butternut's website. 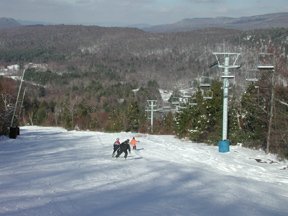 Butternut remains one of Massachusetts' more popular ski areas. It features a vertical drop of nearly 1000', 22 trails, 3 quad chairs, a triple, a double, and beginner lifts. Trails are fun and interesting. One of the best aspects of Butternut is the affordable midweek prices - just $25. For more information, please visit their website. Most of the original ski trails are still available, incorporated into Butternut's expanded system. Here are a couple of photos of them in 2006. I'll take more the next time I ski Butternut. Click on each for a larger version. Looking down Lower Main Street, the former Bottleneck Slope. Looking down the middle part of Downspout, the middle part of Forgotten Bridge Trail. 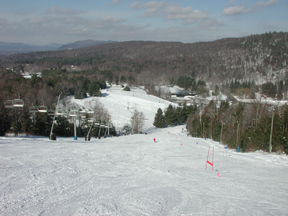 Lower Wildcat - portions of which are now the Lower Cruiser Progression Park. Sources of material for this article included numerous articles from The Berkshire Eagle and North Adams Transcript. 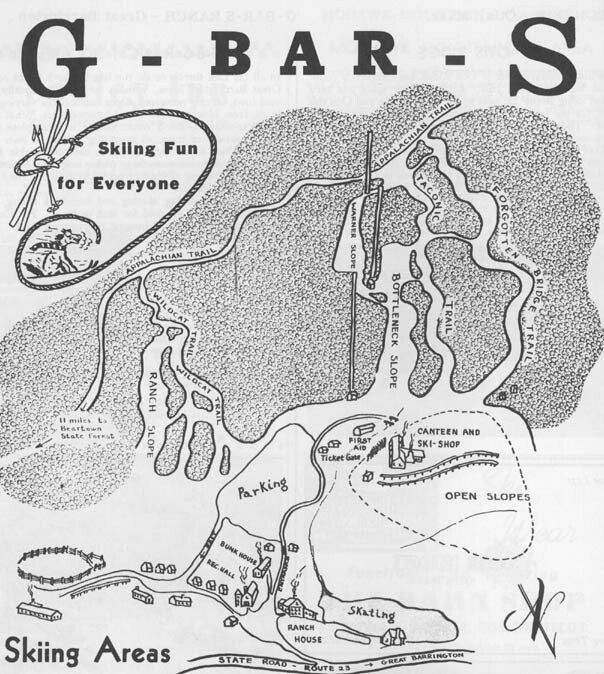 New England Ski History page on G-Bar-S.